SEOUL - The first inter-Korean summit of 2018, a sunny spectacle in late April, reduced war fears on the peninsula. The second, an emergency one in May, helped ensure a historic meeting between North Korean leader Kim Jong Un and President Donald Trump came off. Now, at his third summit with Kim later this week in Pyongyang, South Korean President Moon Jae-in faces his toughest challenge yet: Delivering something substantive that goes beyond previous vague statements on denuclearization and helps get U.S.-North Korea talks back on track. Negotiations between Washington and Pyongyang have sputtered in recent weeks, raising doubts about whether Kim is truly willing to relinquish his nuclear arsenal and putting pressure on Moon to broker progress once again. The result will likely be a crucial indicator of how the larger nuclear negotiations with the United States will proceed. Moon will try to get Kim to express more clearly that he’s prepared to abandon his nuclear weapons, which could create momentum for a second Kim-Trump summit. 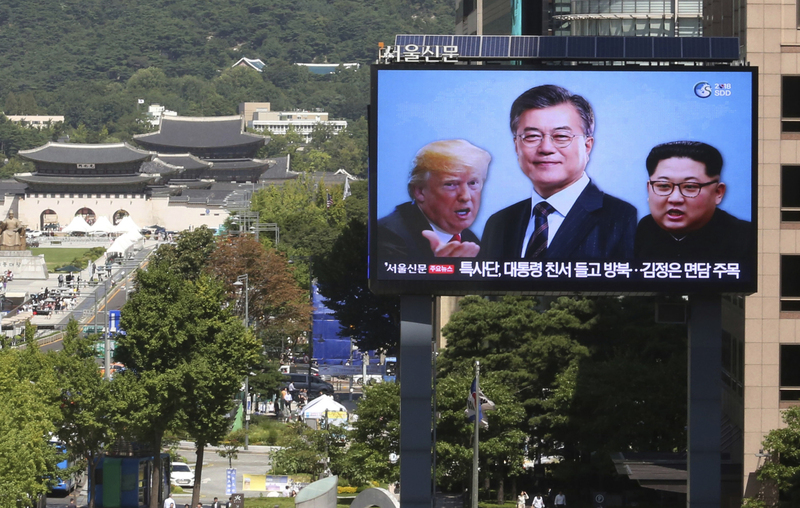 Whether Moon succeeds, fails or falls somewhere in between, the third inter-Korean summit could help answer a persistent question: When Kim says he supports the “complete denuclearization of the Korean Peninsula,” what does he actually mean? Moon heads to Pyongyang on Tuesday facing lingering questions over his claim that Kim, during his conversations with South Korean officials, has privately expressed a genuine interest in dealing away his nuclear weapons and missiles. The wave of optimism that surrounded the first two inter-Korean summits in April and May and the Singapore meeting between Trump and Kim in June conveniently overlooked disagreements about what exactly Kim had committed to. He said it will be crucial for Moon to get Kim Jong Un to give a clearer signal that he is willing to accept credible actions toward denuclearization, such as providing a detailed description of North Korea’s nuclear program, a key first step toward inspecting and dismantling of it. At his meetings with Moon and Trump, Kim signed statements pledging the complete denuclearization of the peninsula. But the North for decades has been pushing a concept of denuclearization that bears no resemblance to the American definition, vowing to pursue nuclear development until the United States removes its troops from South Korea and the nuclear umbrella defending South Korea and Japan. The differences prompted Trump to cancel Secretary of State Mike Pompeo’s planned visit to North Korea last month. After an earlier Pompeo visit, Pyongyang accused Washington of making “unilateral and gangster-like” demands on denuclearization and bristled at the idea that it must take significant steps toward dismantling its nuclear program before a peace treaty is signed or international sanctions are lifted. 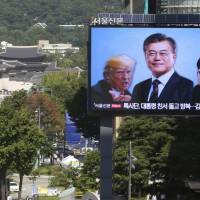 Moon, the son of North Korean war refugees, is eager to keep the nuclear diplomacy alive, not just to keep a lid on tensions, but also to advance his ambitious plans for engagement with the North, including joint economic projects and reconnecting inter-Korean roads and railways. These projects are held back by the sanctions against North Korea. The issue of declaring a formal end to the 1950-53 Korean War will be high on the agenda in Pyongyang. The fighting stopped with an armistice that has left the peninsula technically in a state of war. Chung Eui-yong, Moon’s national security adviser, met Kim in Pyongyang earlier this month, and said the North Korean leader told him that an end-of-war declaration would not weaken the U.S.-South Korea alliance or lead to a withdrawal of U.S. troops. Chung also said Kim wishes to realize denuclearization before the end of Trump’s first term. Chung conveyed similarly promising comments from Kim after a previous visit in March, when South Korean officials shuttled between Pyongyang and Washington to set up the Trump-Kim meeting. He said then that Kim had said the North would not need to keep its nuclear weapons if it received a credible security guarantee and that the North Korean leader understood that U.S.-South Korea joint military exercises must continue. The comments were seen as an important departure from North Korea’s previous stance. But Kim has never made similar comments publicly or in writing. If Moon can’t convince Kim to express a commitment to concrete denuclearization steps, he will at least have to get Kim to put the things Chung has said he was told in a written agreement, said Du Hyeogn Cha, a visiting scholar at Seoul’s Asan Institute for Policy Studies. That would provide a starting point for establishing a timeline for denuclearization, reduce concerns over North Korea’s intent and make it clearer that the North bears the greater responsibility in the efforts to resolve the nuclear crisis, Cha said.